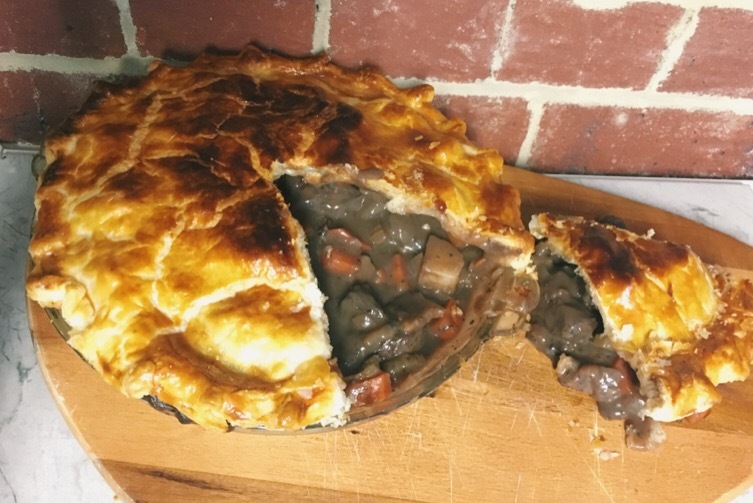 With the array of different meat we have on the website, it was decided that pie week needed a shake up! 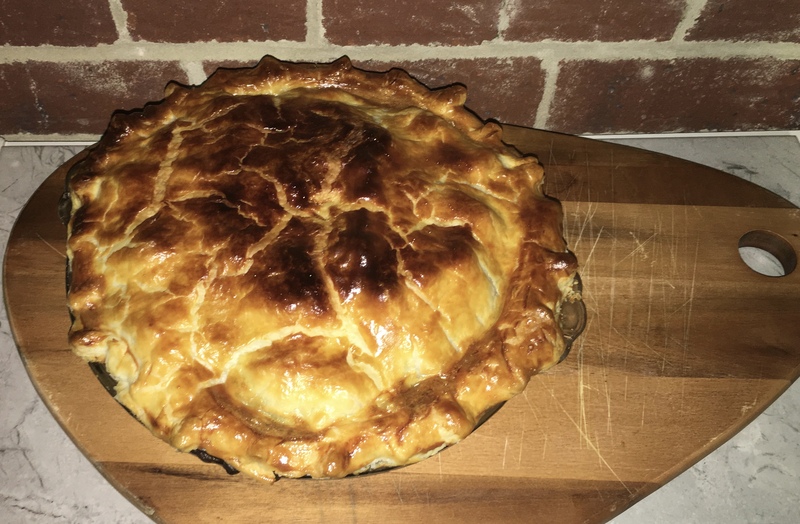 Or a kick in this instance, so Kangaroo Pie was the option of the day. Kangaroo is one of the leanest and healthy meats that we do. Known for being low in fat and high in proteins and minerals we often have the health concious or even those competing for body building competitions calling in for this wonderful meat. Fear not, as Kangaroo isn't just for those aiming to look like Arnold Schwarzenegger in the 70's! No, this beautiful red meat can be enjoyed by the family over on any night of the week. Heres what we used for the delicious pie! First defrost the Kangaroo overnight, do make sure to defrost it in a bowl as sometimes you have blood ooze from the packet. Bring the Kangaroo to room temperature about half an hour before cooking. Cut the Kangaroo in cubes about 1 inch in size, season the cubes of meat with salt and oil. Heat a large saucepan and sear off the cubed Kangaroo in batches to ensure the meat doesn't boil. Remove the meat from the pan and place in a bowl, cover and leave until needed later. Use some of the wine to deglaze the pan and keep all those delicious flavours in the pan. Dice the onions, and chop the garlic quite finely, sweat them off in the saucepan. Peel the Carrot, Celery and Potato, slice the carrot and celery and dice the potato. Add into the saucepan, along with the herbs, stir thoroughly. Add in the Kangaroo and any juices in the bowl. Sprinkle over the flour and stir continuously until the flour has turned brown and the juices have all been soaked up. Season with salt and pepper to taste. Pour over the wine and the two stock cubes, now here is where I didn't then add the water which was suggested in recipes I had found online. The office did make reference to there "not being enough wine (oh hahahah) in here". So if you prefer a less alcoholic stew add in 2 cups of water as well. Bring up to the boil and then reduce the heat and simmer for 2 hours. I then let this cool overnight and used it the next day. During the course of the week I came to the conclusion that it not only fitted well with life, the universe and the washing up, but also to allowing the flavour to really enhance and create a more spectacular filling! Grease and flour a pie dish, line the dish with the short crust pastry. Trim the pastry with leaving a lip all the way around to ensure the pastry lid has something to stick on. Blind bake the pastry for 10/15 minutes in a preheated oven at 180. Set aside to cool. Once cooled fill the pastry case with the Kangaroo filling. Egg wash the lip of the bottom pastry, then lay over the puff pastry. Trim to match the underneath. Using a fork or your fingers, crimp or pinch the pastry to attach to the bottom layer. Put two slits in the middle of the pastry top and liberally with egg wash. Cook in a preheated oven at 180 for 35/45 minutes or until delightfully golden brown. Serve and enjoy!